Evel Knievel played such a huge role in defining motorcycle culture that it's now hard to separate the man from the myth. We break down the facts of his extraordinary life. 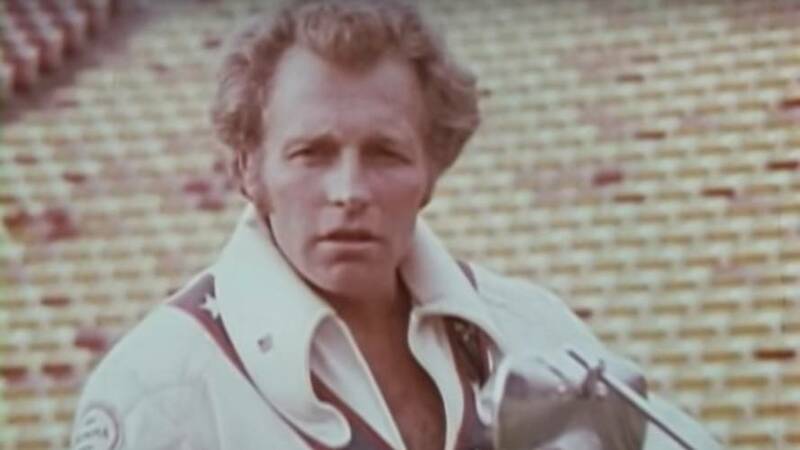 It’s been more than 40 years since Evel Knievel made his last jump and even though his name is still synonymous with motorcycle stunt riding, the details of his career have started to blur over the convening years. Nowadays you are more likely to hear things like “Didn’t he break every bone in his body?” or “Did he ever successfully land a single jump?” rather than any true facts about his career. As someone who had such a profound influence on motorcycling and was a true American legend, we owe it to Evel to get the facts straight about his extraordinary career. Knievel was born on October 17, 1938 in the mining community of Butte, Montana, to Robert and Ann Knievel. Named after his father, Evel's real name was Robert Craig Knievel. Growing up in a rough mining town gave Knievel plenty of opportunities for getting into mischief and his actions eventually led to several run-ins with the local police. One such incident, involving a high-speed motorcycle chase and crash, landed him behind bars where the jailer jokingly referred to him has “Evil Knievel” – a moniker that would stick with him for years to come. He was also known around town as an incredible athlete, participating in rodeos, ski jumping, and pole vaulting, and he played for two semi-professional hockey teams. As a young man, Knievel tried several careers before he stumbled upon the idea of being a “professional daredevil.” Like everyone in Butte, he had a stint working a variety of jobs related to the mines before branching out into other fields. Throughout his 20s, he tried his hand at being a hunting guide, a motorcycle racer, an insurance salesman, and even opened his own Honda motorcycle dealership. None of these jobs stuck and in 1965 he decided to put on a motorcycle stunt show based on the automobile stunt shows performed by Joie Chitwood. His first stunt show consisted of one jump over a 20-foot box of rattlesnakes and two mountain lions (I guess in the 60s you could just rent rattlesnakes and lions for such events). 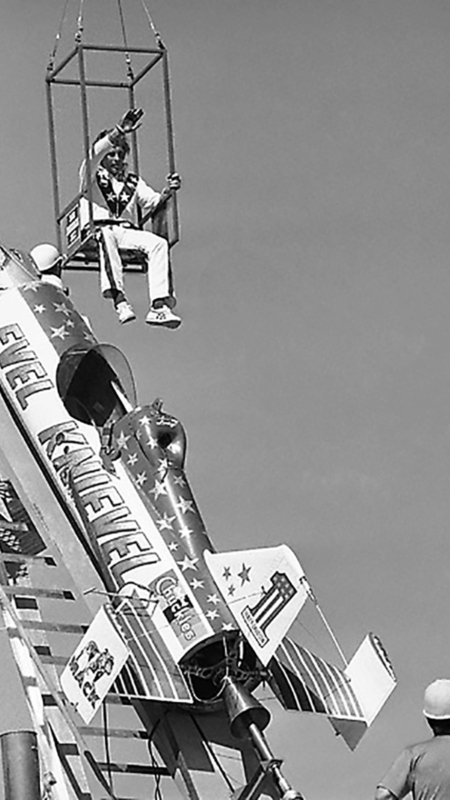 The jump was successful and Knievel quickly realized that if he found a sponsor and a few more performers he might be able to make some real money. In 1966, Evel Knievel and his Band of Daredevils debuted at the National Date Festival in California. 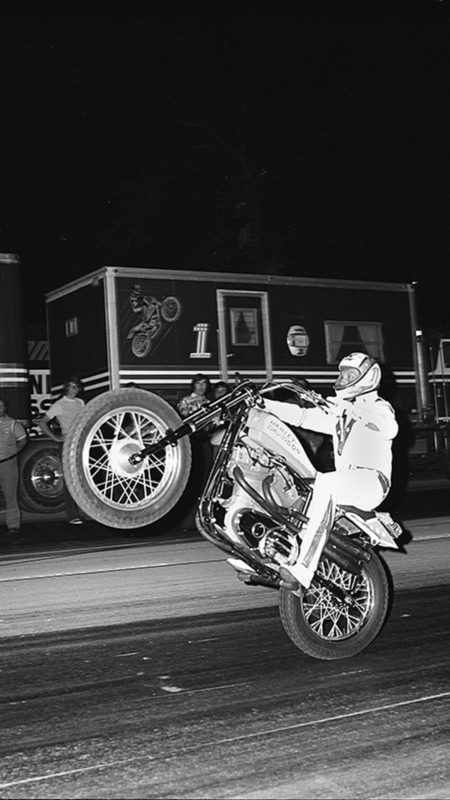 The first show was a big success and for their next show Knievel decided to mix things up with a new stunt where he jumped spread eagle over a speeding motorcycle. This turned out to be an epic failure as the motorcycle struck him square in the testicles and tossed him 15 feet (guys, just let that sink in for a few seconds). A lengthy hospital stay was enough to break up the fledgling stunt team and from there on out, Knievel became a solo act. 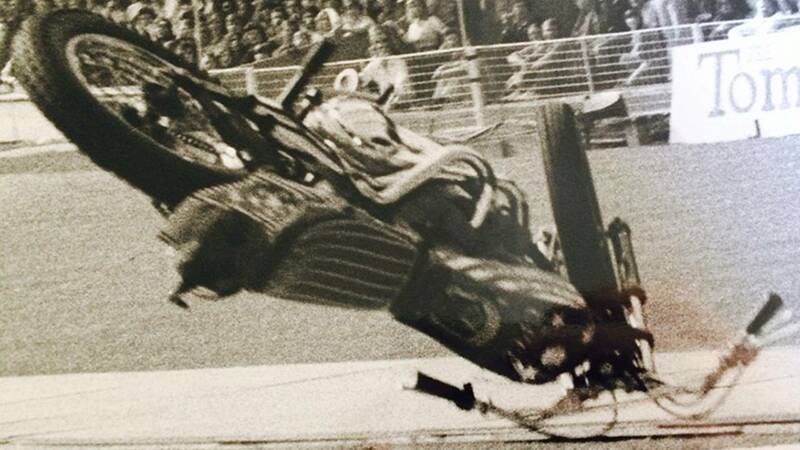 Right from the beginning, Knievel’s claim to fame was jumping vehicles. While other stunt riders were playing it safe and jumping over pools of water or semi-soft animals, Knievel was jumping a much more unforgiving selection of cars, trucks and vans. Just a few months after his “spread eagle” incident, a jump consisting of 12 cars and a van sent him back to the hospital with a broken arm and several broken ribs. The following year, another crash left him with a serious concussion, but he kept performing and with each jump his popularity grew. It also became obvious that his failures were even more popular than his successes as there seemed to be a morbid fascination with this unstoppable force of nature whose resilience bordered on being super human. 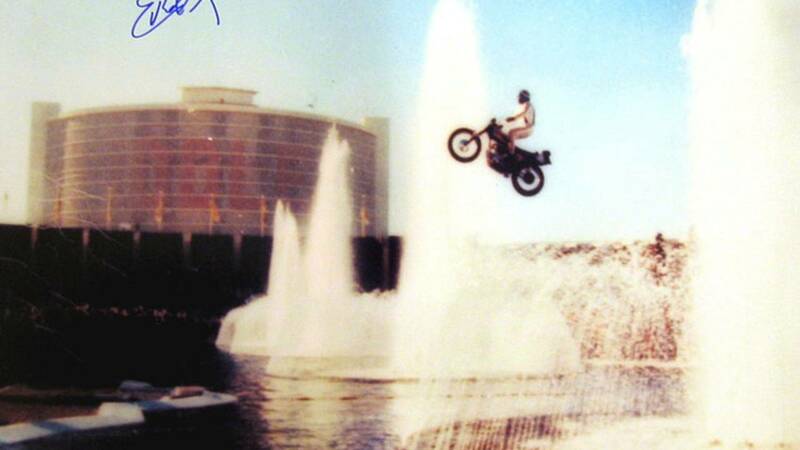 With his star on the rise, Knievel successfully negotiated a deal to jump over the fountains at Caesars Palace in Las Vegas on December 31, 1967. Although he wanted to have the event aired live on ABC’s Wide World of Sports, he had to settle for a low-budget film which he paid for out of his own pocket. The jump itself was one of Knievel’s biggest failures as a daredevil and the injuries he sustained seemed unsurvivable. When it was all said and done, he left Caesars Palace with a crushed pelvis and a crushed femur along with a fractured hip and fractures to both wrists and ankles. He also remained in a coma for 29 days due to the severity of the concussion he received upon impact after the failed jump. As you can guess, even this wasn’t enough to slow Knievel down and in less than six months he was back to jumping (and crashing). Although it is the crashes everyone remembers, his success rate was actually fairly high. The early 1970s saw the most Knievel performances and his records for those years showed that he was an extraordinary rider. In a three-year period from 1971 to 1973, Knievel made an incredible 87 jumps, of which 82 were successful. It is also important to note that on December 12, 1970, Knievel switched from riding various British motorcycles to exclusively riding a Harley-Davidson XR-750, which arguably was a better platform for the type of abuse Knievel was heaping on his motorcycles. While almost all of Knievel’s jumps involved lines of cars, buses, etc, he also gained much notoriety in his attempt to jump the Grand Canyon and later the Snake River Canyon. Starting in 1968, Knievel began floating the idea of making a jump across the Grand Canyon probably as a publicity stunt more than anything else. Surprisingly the major stumbling block had nothing to do with the actual mechanics of making such a long jump, but with the U.S. government. Even after hiring an attorney to take the battle to court, Knievel was never able to get the US Department of the Interior to grant him permission to use the air space over the canyon for a jump. Not one to give up, Knievel leased some private land on the Snake River Canyon and started developing a plan for jumping that 1-mile-wide canyon instead. Obviously his Harley-Davidson XR-750 was not up to the challenge of such a long jump, so a special machine had to be developed to clear the canyon. The result was the Skycycle X-2, a two wheeled, steam powered rocket complete with a fully enclosed cockpit and a parachute to simplify the landing. The amount of time and money put into this stunt far outweighed anything Knievel had previously attempted, and many feel it would have been successful had the design of the parachute system not been faulty, causing it to deploy prematurely. The result was that Knievel cleared the canyon, but the prevailing winds caught the parachute and blew it back across the canyon where it crashed down next to the river. The failure at Snake River Canyon really seemed to “take the wind out of his sails” and Knievel only attempted six more jumps before announcing his retirement (for the final time) in January of 1977. Of these six attempts, three resulted in crashes. 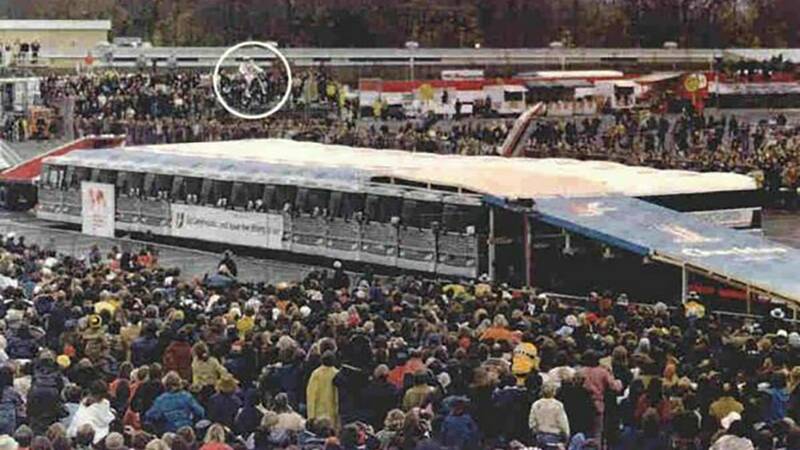 One of those crashes, however, was – in a strange way – one of his greatest successes. The crash at Wembley Stadium in London still ranks as the all-time highest rated episode of ABC’s Wide World of Sports. 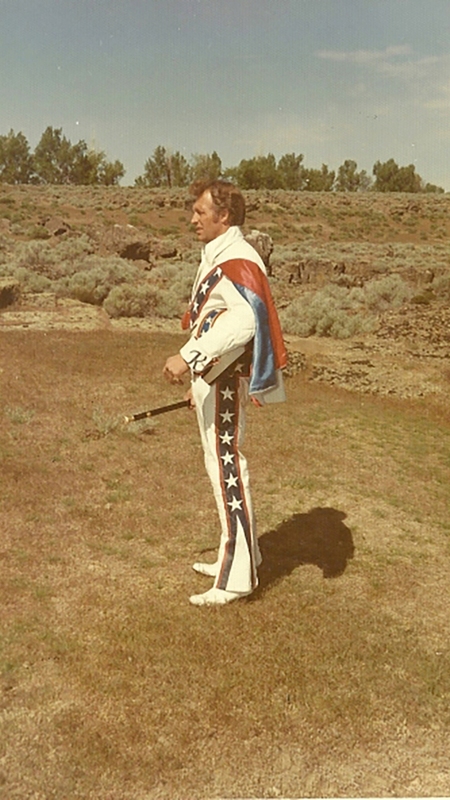 Always a brilliant self-promoter, Knievel was in and out of the public eye for the remainder of his life. I, in fact, had a brief encounter with him in the mid 1990s while attending Bike Week down in Daytona Beach, Florida. My father and I had stepped into a shop on Main Street to check out leather jackets when we heard some commotion in the back of the store. 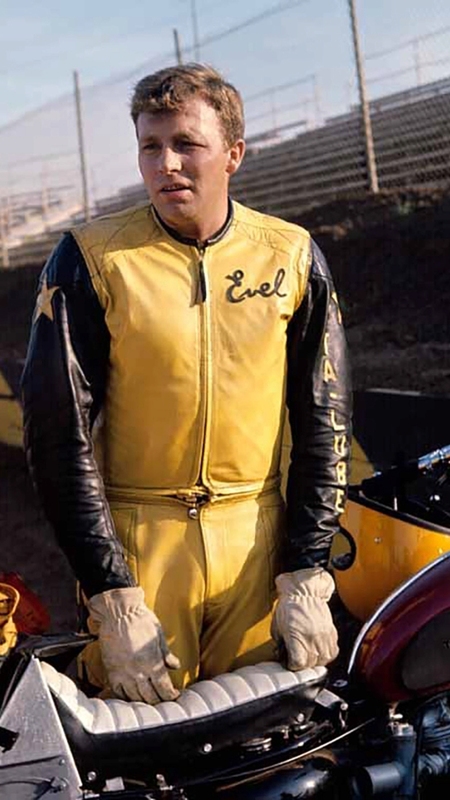 As we glanced past the racks of jackets we saw Evel Knievel holding up one of his new signature jackets; he was obviously displeased with the quality. At the time he was in his early 60’s and I remember thinking that all those crashes had finally caught up with him as he hobbled past me and back on to the street. 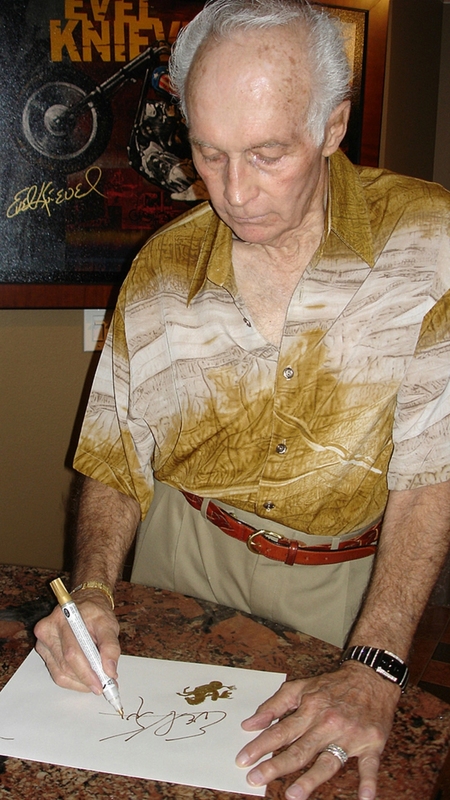 Ironically, while he certainly suffered from having broken 35 bones during his career, his death was due to a rare and incurable lung disease known as idiopathic pulmonary fibrosis. He died on November 30, 2007 due to complications of the disease and was laid to rest in his hometown Butte. In true showman style, Knievel arrived at his funeral laid out in his iconic red white and blue leathers under a rain of fireworks. The eulogy was given by actor Matthew McConaughey who eloquently stated: "He's forever in flight now. He doesn't have to come back down; he doesn't have to land." This year also marks a new chapter in the legacy of Knievel with the opening of the Evel Knievel Museum in Topeka, Kansas. The museum’s soft opening was on 26 May – 42 years to the day after the failed jump at Wembley Stadium. The grand opening is set for June 30, to coincide with the 4th of July holiday weekend. Keep in mind that this is a totally new construction, so you’ll not just be walking past a collection of dusty old artifacts in some dimly lit warehouse, but a modern building with exhibits that benefit from state of the art technology. Whether you grew up eating out of an Evel Knievel lunch box or you’ve just watched his jumps on YouTube it is hard not be a fan. His larger than life persona and “extreme courage” are traits to be admired if not emulated. Through his actions he not only encouraged a generation of kids to jump their bicycles off makeshift ramps, but more importantly he taught them value of hard work, commitment, and determination. He rose to popularity at a time when all Americans were in need of not just entertainment but a hero. Between the Vietnam War and the Watergate Scandal, the late 60s and early 70s were a tumultuous period for this country and Evel Knievel was someone we could all root for. On the surface he may have just been jumping a motorcycle over a line of cars, but deeper down, he truly embodied the American spirit and still serves as an inspiration today. 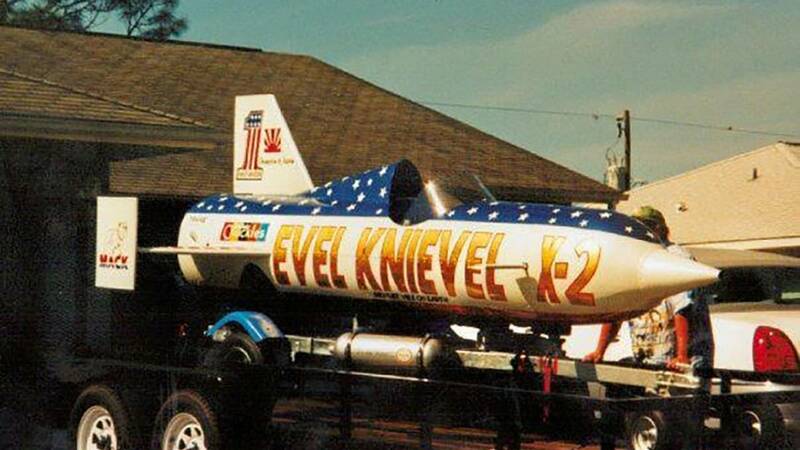 Photos provided by the Evel Knievel Musuem.